Leontes's accusation of Hermione and Polixenes is such a complete shock to Camillo (as it will be to the rest of the court) that he simply can't grasp it—and Cotterman's Leontes in turn can't grasp that Camillo can't grasp the obvious. Hurt is a powerful force. Some of the world's greatest evil is generated by a slight, real or perceived, something many people can't understand, until they feel such hurt themselves. It is getting at the hurt that we get a better understanding of and, perhaps, some empathy for William Shakespeare's villains, including Iago, Richard III, Don John, and Aaron. 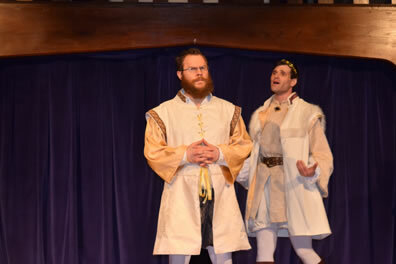 Leontes (Chris Cotterman, right) berates Camillo (Conrad Deitrick), who can't see what Leontes thinks is the obvious signs of an affair between Hermione and Polyxenes in the Baltimore Shakespeare Factory production of The Winter's Tale. Photo by April Forrer, the Baltimore Shakespeare Factory. And Leontes. In previous productions of The Winter's Tale, I've most often seen Leontes played as a tyrannical despot and sometimes as an emotionally fragile man stumbling into a pathological psychosis. With this Baltimore Shakespeare Factory (BSF) production and Chris Cotterman playing the Sicilian king, I've now seen him as, simply, hurt. It brings a fascinating element to this production that was supposed to be fascinating merely on the merits that it is being presented with Original Pronunciation (OP), speaking the text in the manner and dialect that Shakespeare's London would have heard it. This is BSF's second OP production. A year ago it staged a generally successful OP version of The Merchant of Venice, and the company is dedicated to staging at least one OP production per year (Antony and Cleopatra is on the bill for next year) with assistance from David Crystal, an expert in the evolution of the English language. Seen as merely a gimmick by some but by others as revealing of Shakespeare's true intents and character development, OP turns out to be entirely incidental in this Winter's Tale. In fact, we had trouble understanding the lines not because of the pronunciation (the actors are fairly adept at carrying it off) but because of the play space's difficult acoustics. There's some irony in this. With last year's Merchant, my complaint was that while the pronunciation was good, BSF Artistic Director Thomas Delise, who helmed the play, did not move his actors around much, making for a generally staid presentation. With this year's Winter's Tale, Director James Keegan brings his veteran actor sensibilities to the play's blocking, but in the church sanctuary that is the theater, we can't fully hear actors speaking in any direction except right at us. That, however, is my only denigration of Keegan's influence on this production and this play. We've long admired his acting at the American Shakespeare Center's Blackfriars Playhouse and at the Folger; this is his first foray into directing a professional production. He comes to it having played Leontes in last year's elegant Winter's Tale at the Blackfriars and bringing with him the influence of that play's director, Jenny Bennett. "Why fix what ain't broke," he told me before the show, referring to Bennett's approach to the play; he promised we'd see a lot of familiar things that he stole from her. Ah, but it was the unfamiliar things that he brought to The Winter's Tale that stand out. One was as simple as choosing which actor to double as the chorus-like character of Time, who transports the audience 16 years ahead in the middle of the play. It could be anybody (in the Blackfriars production it was the bear); it could be everybody, as I've seen it done before. Keegan chose the actress playing Paulina, Marianne Gazzola Angelella, to play Time and presents her as a gardener (in modern dress as opposed to the medievalish fairy tale costumes of the rest of the play designed by April Forrer). The garden allegory, inspired by the metaphors in Time's speech, leads into the springtime tone of the play's second half while the subtext of Paulina's presence bolsters that character's role in stage managing the play's outcome. Another of Keegan's choices is one all directors must tackle in their own singular way: how to play that famous stage direction, "Exit, pursued by a bear." Noting that we have no idea how Shakespeare himself staged this business, Keegan pointed out in a pre-play talk that directors have a spectrum of possibilities as wide as their imaginations. Keegan sought to widen that spectrum by consulting fellow actors, one of whom suggested creating the bear out of several actors. From that germ we get more than a Build-a-Bear experience (just think of the sponsorship potential of such an idea): with the actors already on stage to form the bear, Keegan has them wearing blank, white masks and white gowns, their movements representing the growing storm Antigonus (David Forrer) describes as he leaves the infant Perdita on Bohemia's shore. Having to double those actors, one, perchance, is Valerie Dowdle, who otherwise plays Hermione; so, when Antigonus describes the dead Hermione coming to him in a dream, the masked Dowdle mimes Hermione's part in that visitation. The whole sequence is a visual highlight of the production, even matching Dowdle's skillful work in the statue scene at the play's climax. Nevertheless, it's Keegan's influence on character interpretations that resonate most in this play (not a practitioner of OP, Keegan left that side of the production to Assistant Director Emily Sucher, who worked the OP Merchant). Thus, we get Cotterman, a BSF regular, doing some of his best work as Leontes. He manages the "Too hot, too hot!" line more smoothly than I've ever seen because it rises out of uncertainty rather than certainty. He delivers the first "Too hot" as surprised hurt, which in the instant turns to surprised anger with the repetition. Leontes has been watching Hermione, whom he enlisted to convince his best friend, the Bohemian King Polixenes (Terry O'Hara), to linger longer on his visit to Sicily. Though she's teasingly flirtatious, the interactions between Hermione and Polilxenes are purely innocent—it's two good friends instead of not-so-secret lovers. It all seems purely innocent to Leontes, too, until he learns that Hermione has prevailed on Polixenes to stay. "At my request he would not," Leontes says, and Cotterman indicates here the first hint of hurt. Trying to recover his place in this triad of friendship, Cotterman's Leontes follows by telling Hermione that she "never spokest to better purpose…never, but once," referring to the moment she agreed to marry him. Dowdle's Hermione, not picking up on her husband's sudden insecurity, teases him rather than requites his romantic opening, and this leads—logically in Cotterman's portrayal—to his sudden but certain slide into jealousy. In personal conversation afterward, Cotterman provided an apt description of Leontes's jealousy as a flood that starts an inch deep and before you know it is over your head. "I'm my own Iago," he told me. Once there, his Leontes's certainty is so strong he not only warps all he sees, he believes all he sees is obvious to everybody else. Leontes often alludes to this—"They're here with me already, whispering, rounding 'Sicilia is a so-forth'"—but Cotterman plays it, too. The most telling scene is with his loyal advisor, Camillo (Conrad Deitrick). Leontes's accusation of Hermione and Polixenes is such a complete shock to Camillo (as it will be to the rest of the court) that he simply can't grasp it—and Cotterman's Leontes in turn can't grasp that Camillo can't grasp the obvious. Cotterman's tone throughout this dialogue is to treat Camillo as an idiot, even getting in Camillo's face to seethe his disappointment at what a clueless fool his longtime advisor has turned out to be: "I say thou liest, Camillo, and I hate thee, pronounce thee a gross lout, a mindless slave." Camillo tries to temporize Leontes, at one point saying "I have loved thee…" but Leontes cuts him off: "Make that thy question, and go rot!" which Cotterman delivers with a distinctly "f**k you" timbre. Cotterman's Leontes continues in this vein through Hermione's trial. Whether it's his council of lords, Paulina, or Hermione, nobody is sticking to the script he thinks they should be following. There's exasperation in his angry reactions rather than ingrained tyranny, and he resorts to the same belittling tone he used with Camillo. That all changes when he defies Apollo's edict and word immediately comes that his son, Mamillius, has died, and then Hermione falls fatally ill: a double hurt, each far greater than the previous hurt that had originally infected his brain. This reading engenders some sympathy for Leontes, which allows the audience to more easily embrace his despondency for the second half of the play. We cannot—nor should we ever—excuse his behavior, leading as it does to the deaths of Mamillius and Antigonus, but we see how easily we also could slip down such a slope into delusion. 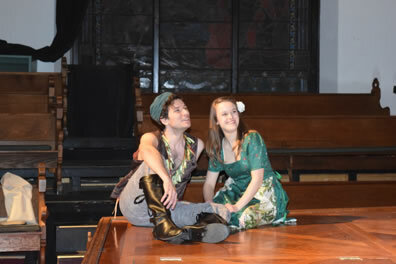 Florizel (Brendan Kennedy) and Perdita (Kathryn Zoerb) watch the festivities of the sheepshearing feast during the Baltimore Shakespeare Factory's production of William Shakespeare's The Winter's Tale at the St. Mary's Community Center, a former church. Photo by April Forrer, Baltimore Shakespeare Factory. Kathryn Zoerb portrays Mamillius as a kid with ADD/ADHD, always playing but squirming away from his dad when he's seeking some solace for his insecurities somewhere. Zoerb comes back to play Perdita as a bright-eyed young lady, romantic to the core but stoutly standing up to Polixenes's violent threats toward her and then maintaining her pride as she dismisses Prince Florizel (Brendan Kennedy). She is her true mother's and adopted father's daughter. Two other performances stand out in this production. Rena Marie takes seriously Shakespeare's designation of the old shepherd's son as Clown. She brings a clowning style of playing to the role, with pronounced physical gestures that prove to be exact fits to what the character speaks. "To see how the bear tore out his shoulder-bone," Clown says, and Marie mimes her left arm being pulled off; "how he cried to me for help and said his name was Antigonus, a nobleman," which Marie speaks with her left arm hidden behind her as if Antigonus were in the middle of a Monty Python skit. Jess Behar, meanwhile, turns Autolycus into a Borscht Circuit showman, a wannabe Broadway song-and-dance star using the audience as his straight man, working us like a comedian goading a Catskills resort crowd. Disguised as the peddler of ballads at the sheepshearing feast, she carries such props as a snake and a giant fish hidden in her coat that she uses in her description of the ballads—and then tosses them back over her head into the upper gallery (or attempts to toss—snake and fish return to the stage a couple of times before successfully reaching their purposed destination). It's an over-the-top portrayal, but Autolycus is an over-the-top character, and Behar has the audience rollicking in laughter. When she and Marie combine their talents in scenes featuring both rogue and clown, respectively, it's comic gold.